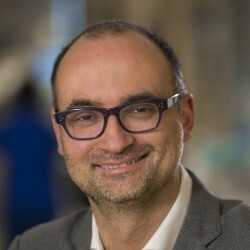 Alberto Goffi, MD, is a Staff Physician at Toronto Western Hospital – University Health Network and Assistant Professor at the University of Toronto, Department of Medicine and Interdepartmental Division of Critical Care Medicine (IDCCM). After graduating from the University of Torino (Italy) and completing his internal medicine/emergency medicine training in the same city, he moved to Toronto in 2010 for a fellowship in adult critical care medicine. His clinical and academic interests include neurocritical care and point-of-care ultrasound in acute care medicine, with a focus on the clinical utility of ultrasound in critical care medicine and optimal teaching strategies for its competency achievement. Alberto loves travelling for teaching; he has already taught ultrasound and neurocritical care in five different continents. In 2015, he won the Young Lecturer Award at the ESICM annual meeting. Outside of work, Alberto has a passion for creating logos and drawings using his computer; the IDCCM logo is one of his creations. 2015-2016 The John Granton Award for outstanding contribution to Critical Care Education, Interdepartmental Division of Critical Care Medicine, University of Toronto. 2015-2016 Award for Individual Teaching Excellence – Toronto Western Hospital, Interdepartmental Division of Critical Care Medicine, University of Toronto. 2014-2015 Award for Individual Teaching Excellence – Toronto Western Hospital, Interdepartmental Division of Critical Care Medicine, University of Toronto.